It’s no fun being a general anymore. The world press somberly reported another broadside by retired Pakistani army generals against Pres. Pervez Musharraf. But there was more going on than “grim-faced emeriti of Pakistan’s most powerful institution unload on faltering prez”. In an undeferential and confrontational press conference, the retired generals flinched and fumed as they took more than a few salvos themselves. The only detailed report I found was in Pakistan’s The News. In an article entitled Retired Generals Refuse to Apologize, But Want Musharraf to Go, reporter Umar Cheema highlighted the hypocrisy of these newly-minted champions of Pakistan’s constitution and democracy. Except for retired Lt-Gen Hamid Gul, none of the leaders showed moral courage by making an admission of guilt or apologising to the nation for their past. They did not even feel any embarrassment on their roles when asked by newsmen at a press conference. 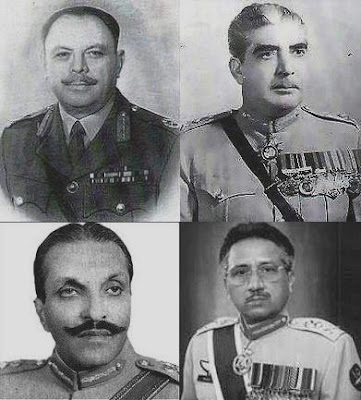 ...the other architects and supporters of martial law who were sitting on the stage...included retired Lt-Gen Faiz Ali Chishti, Gen Mirza Aslam Beg, Air Marshal Asghar Khan, Lt-Gen Majid Malik and Lt-Gen Asad Durrani. They showed no remorse for their past conduct. Air Marshal Asghar Khan, who awas presiding over the meeting, was annoyed when he was asked about his past role and whether he was ready to apologise. “These were individual acts of different individuals,” he responded. He did not respond when a journalist questioned their moral authority to preach others when they did not feel embarrassed on the wrongdoings of their past. Khan, however, remained uncomfortable while facing critical journalists with his colleagues sitting in the hall, yelling ‘planted question’ whenever a query about their accountability was put to him. ...He refused to take questions on self-accountability and was pressed time and again that he himself was among the strong supporters of General Zia’s martial law and the person sitting next to him, Lt-Gen (retd) Faiz Ali Chishti, was Commander 10 Corps when Zia had taken over and later collaborated with him in all his acts. Questioners also mentioned Gen (retd) Beg under whose stint as Army chief the Mehran Bank scandal took place and the then president had nominated his successor three months before Beg’s retirement as a pre-emptive measure keeping in view his political ambitions. But neither Asghar Khan showed the grace to admit any wrongdoing nor did Chishti and Beg. All hail Umar Cheema. His acrid report on this acrimonious meeting provides the clearest picture possible both of the sagging fortunes of Musharraf and the declining prestige of the army, at least among the educated civilian class. With the expiration of Benazir Bhutto’s mourning period, Pakistan’s parliamentary election campaign is heating up. Hopefully, we’ll see more reporting like this. If military dictatorship was to be the best thing that ever happened to Pakistan since sliced bread, it would have worked by now.